Building a life, moment by moment. Including yummy food. 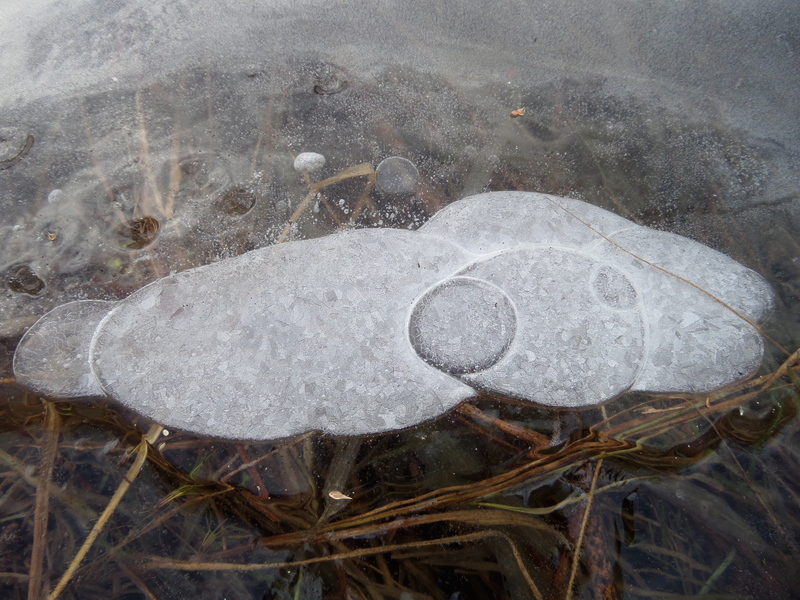 Signs of life–though frozen–bubbles in a pond at Partridge Run, December 2014. In my mind I saw her flowing, reddish-brown hair, loosely twisted into a bun to keep it from catching on low branches, wearing a green-and-white checked flannel jacket, and carrying a notebook and pencil. Poet or not, she was making her way ahead of us, up the side of the snowmobile path off the southernmost trailhead at Partridge Run, in early December. I knew I was embellishing the facts with this mental picture—but that day in the woods, I could clearly see evidence of her narrow, well-worn hiking boots. I could tell The Poet was short (because of her length of stride) and curious (wandering some, clearly stopping here and there), and in good enough shape to climb the side of the hill, though she wasn’t particularly skinny, looking at the depth of her steps. Snow had fallen the afternoon before, so all the tracks were fresh. 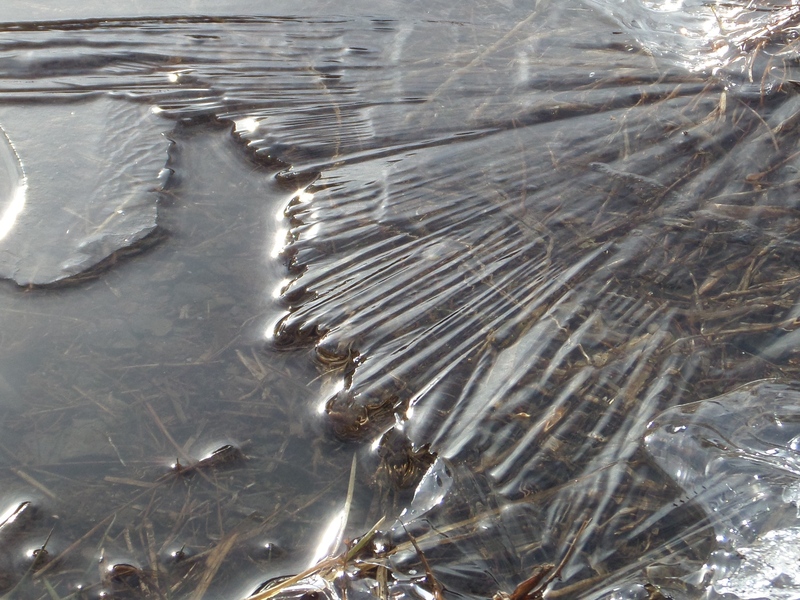 At the near freezing temperatures, shards of ice and sunlight. Partridge Run. My friend C and I had ventured out on a sunny day into the glittering white of Partridge Run Wildlife Management Area, huffing and puffing while we followed the course of multiple snowmobiles, along with plenty of hunter boot prints and shotgun shells, dog tracks, square snowshoe indentations, and traces of quick light mice along with vole burrows. The hemlock- and red oak-lined path had been somewhat traveled after the snowfall. 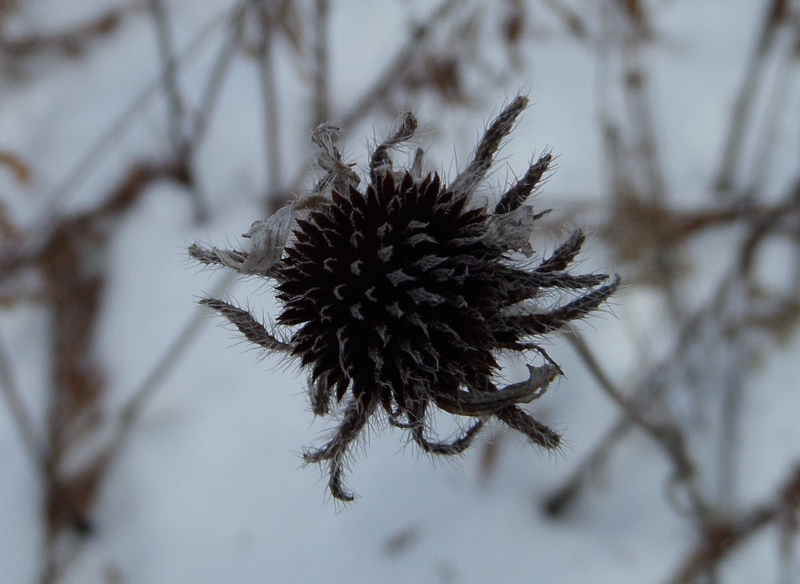 Dried flowers, wild like the poet’s hair. After half an hour on the trail, we consulted our map. 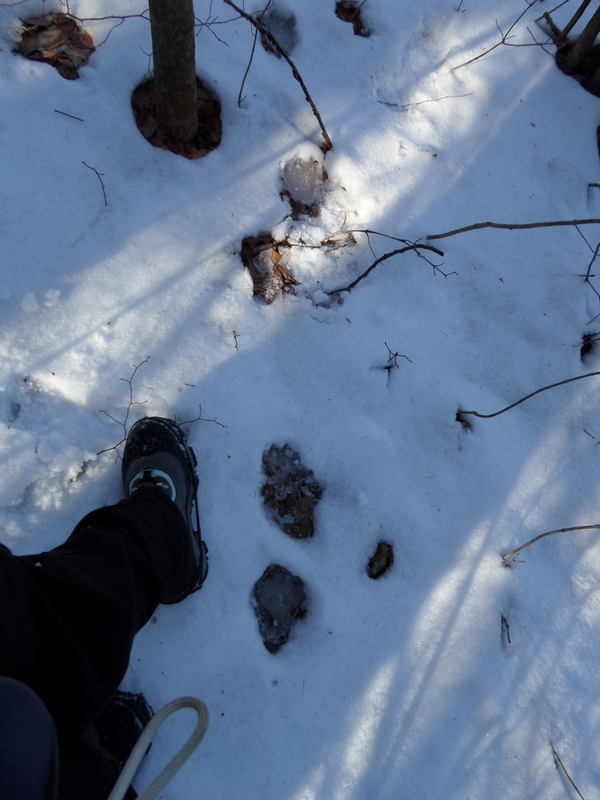 As we trekked up into deeper snow, we were happy to see others had done this before, including a large-booted hunter (more shotgun shells) and the woman I was calling The Poet. Due to the hunter’s presence, I re-imagined her outfit, with a neon orange vest for safety. Hip high stacked rocks wiggle and waggle all over woods and mountains in the Northeast, climbing up at near-impossible angles; in addition to stone fences, in the woods we often find evidence of rusting farm trucks, decrepit apple orchards and even the foundations of homesteads, with domestic bulbs and roses sprawling untended but lush in the middle of the overgrowth. 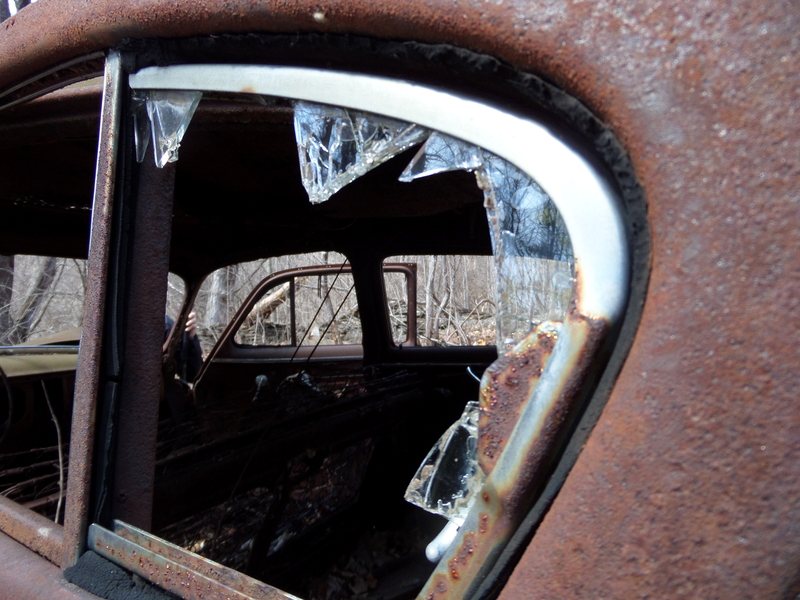 View through a late 1930s sedan on the W5 Trail, John Boyd Thacher State Park. “She went over here! Boy, her boots seem awful pointy, for being in the snow! I wonder if she didn’t know it was going to storm.” The footwear pictured in my mind changed to western boots. I followed one of The Poet’s side tracks as my partner veered left. The woman had scrambled over a tall pile of wiry brush. I half-wondered: why would she do that? If she were hiking over the hill like us, or even taking pictures or writing—none of those scenarios made sense with crawling like that. I started to get a funny feeling; not sure why my heart had started racing, I called to my companion. Silence. Hiking Mate was obviously distracted. “Huh?” She readied to climb over the wall to follow the recent steps. As I hurried to catch up with my pal, following the prints between her and me, sunlight from the east glinted in the rapidly icing holes. I could now see distinct indentations at the front, of claws, and then the somewhat loping pattern of full and partial marks stretching out in front of me. We didn’t stop to pull out our laminated Animal Tracks brochure to confirm one way or the other. The lope and pigeon-toed angling of paw prints looks like a bear, but I am still not sure. We once again experienced hightailing it out of the woods, sensitively aware how the energy changes when you believe you are close to an omnivore, even a probably-shy one. The tracks could not have been more than eight hours old. Maybe fresher. A vague memory hovered in my mind, of something familiar about this situation, perhaps a news story I’d read long ago? The details returned with the same increasing speed as our legs, which wheeled faster and faster back down to the snowmobile path—yes, that’s right, it was a report of people following with relief what they thought were human prints. Laughing and relaxed, they’d enjoyed themselves on the path back to civilization, only to find themselves instead facing a bear at its cave entrance. I don’t remember what the consequences were for them, didn’t want to actually, even when we were back on more well-traveled terrain. We could have repeated that story. Gulp. 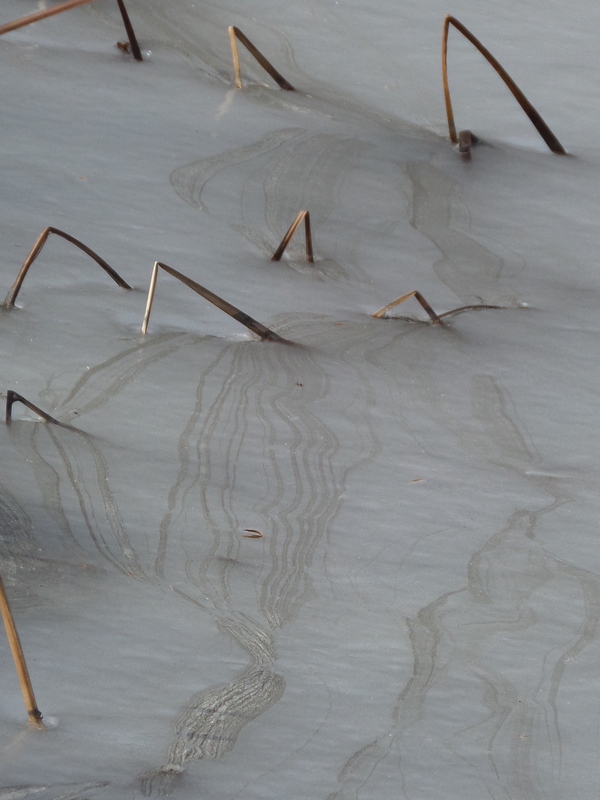 The path of the fronds frozen in ribbons. The rest of the day we joked about the bear, with a slightly nervous edge to our laughter. How tricky that bear was. How it wore such nice boots. How it sometimes switched to snowshoes just to fool us and left its shotgun shells behind to throw us off. How it rode the back of the snowmobile, hanging off the side and careening, breaking branches that we had to move out of the path. How it had tossed beer cans and candy wrappers out the back—what an ill-mannered bear! How it pretended to be a poet, just to get us up that hill. I was glad we didn’t actually stumble across The Poet. Since she wasn’t a poet at all. 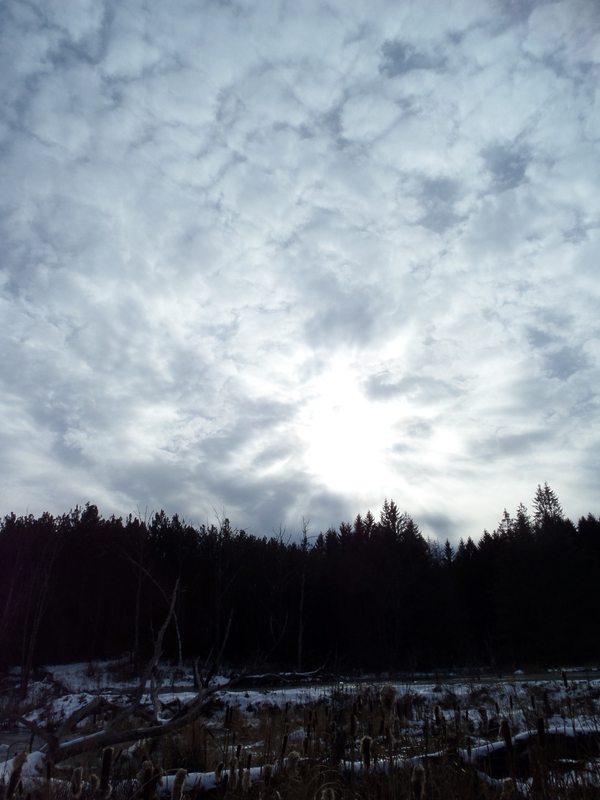 Winter sun over side of Pickerel Ponds, Partridge Run Wildlife Management Area.